Last night, Question Time: the BBC’s ‘political debate’ show, invited the leader of the BNP onto the panel. This caused a lot of furore in the papers and calls for the government to refuse to appear or send in a ‘bug gun’ to shoot the BNP down. The result was that veteran politician Jack Straw was dispatched to inform what the government think of the BNP. They were not happy about being on such a panel with him. However, I say they should be. The most important thing for a democracy to be is open. Openness is the armour and the sword that truly defeats racism, or indeed any sort of ‘ism. What openness says is that, “you may not skulk in the dark throwing angry lies or extreme opinions about without having the spotlight put on you.” This has led to a peculiar creature being born in the halls of power; politicians who are not allowed to have their own views. That is to say, they are not allowed to express them. They must toes a party-line, or stand as an independent. Keeping quiet and “on-message” is so important that it is almost impossible to get a straight and direct answer from any politician and the attempt to do so is the format of many a new program and debate show. Question Time is such a show and, for the purposes of pretending to host real debates, it has a panel. Panels are a format that pitches the political group directly towards the audience. This is not the platform for debate between the people in the panel as they are not truly facing each other. Rather it is supposedly a way of answering the audience’s questions on a one to one basis. The entire panel are allowed to sound off on a subject and they are supposed to answer only for themselves. However, often, and this is not discouraged, they actually sound off on the people who have spoken before them. Therefore, a Labour MP may go first and a Tory then spends 3 minutes trying to blow the Labour argument to pieces. There is very little time for counterargument, so basically the experienced politicians have no choice but to be very ‘safe’ in what they say and even more ‘on message’ than normal. Non “natural” British out. As if being British can be defined by mere genes. They say that this change is to defend against the modern genocide of the British people, but the truth is this is not a British question. In fact, it has been with us (and all nations) since the dawn of time. It is the Question of “foreigners”. The Magna Carta, England’s first document of rights and lauded at all levels as the first step towards democracy, actually contained directly racist views in it. In its case against the Jewish people, who it advised against borrowing from. Such sentiments against so called “foreign influence” have always been debated and indeed inflamed by the racist policies contained within a minority. However, having such people in the democracy is a vital part of the political process. Because democracy only works is it is totally representative of all the views in the country rather than just the majority. There comes a time when the prevailing winds and tribulations require a change in leadership in the Commons. This tends to drift between the two main Christian Democratic parties, but in the past has drifted the way of the Liberals or further. This is in response to general feeling in the country and the situations and challenges to be found in the world. Such change become meaningless without freedom to debate it. People like Griffin throw the others into 3d, his views provide the contrast for the others. For example, Churchill is often exposed as a Tory hero. However, keep in mind that his actions during WWII (such as the bombing of Dresden) would be illegal today. I am not suggesting that they were anything but necessary back then, rather that we could not realistically judge where he would stand today. 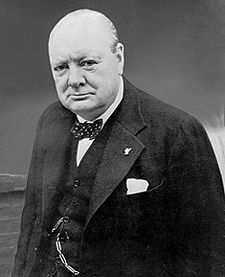 In fact, it is important to remember that Churchill was a member of a Liberal government as well as a Tory Prime minister; he was able, as was more acceptable in MPs back then, to change his point of view as needed. Churchill, considered the greatest ever British politician. Such changing is not welcomed today. The parties in a democracy are an indication of the distribution of the views held by the collective. Therefore, there will always be a ‘nationalist’ viewpoint and in fact that is important. Without a representation of such views, groups of people, perhaps large groups, would be feeling significantly marginalised and possibly become more violent. Bring them into the limelight and such behaviour will not stand the scrutiny. This worked with the Irish Terrorist parties far better than ignoring or banning them did. To me, the real danger in a democracy is that the system will degenerate into a two-part state. An issue found currently in the US, where the two parties are essentially identical and all non-mainstreamed voices are silenced. What silencing them does is disenfranchise minority opinion and lead to a system where the majority party has no checks and balances whatsoever. This leads to agendas being forwarded, without challenge, and that can be monstrous. Consider the US invasion of Iraq, all dissenting voice, all of it, was viciously attacked in the press. The fact that the majority had whipped itself up into frenzy and stopped listening to any other voices meant that the disastrous invasion went ahead with enormous backing. This lead to over 500,000 people being killed. Minority opinion is vital to a healthy running democracy. It is a way of taking the pulse of a nation. It does not need to be feared or encouraged; it just needs to be heard. So, if that is enshrined in the democratic system, what is the problem? The problem is over-exposure. The parties that appeared on the Question Time panel know all too well that it is not a debate show. None of them treated it as such and all of them attacked Griffin. By allowing the BNP onto the show, they feared that it will expose the racist minority view to more people than it naturally appeals to. What Mr Griffin said on the show was illuminating: he said very little. He stayed away from the central message of his party, a message that carries the explicit notion of the “natural superiority” of the “whites” and instead focussed on a view that is only the tip of that iceberg: immigration. The panel attacked Griffin relentlessly for what they claimed he said in other formats and at other times, while at the same time criticising him for defending himself using the same methods. He did not rise to it at all and that was a worrying sign for it shows that he isn’t just a racist idiot; he is also a politician. 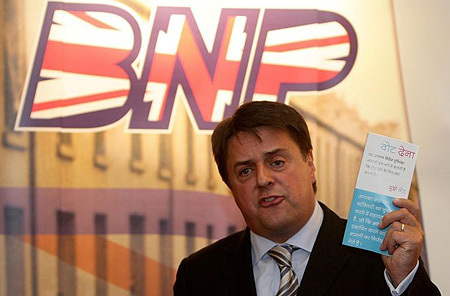 The BNP knows that merely being invited onto Question Time was a success. The other parties know it too and unfortunately turned the program into an attempt to discredit the viewpoint of the BNP and not debate them. Perhaps the BBC really knows that any proper debate comes from the people watching the show at home. In my household, the program lead to a serious debate that went on for hours and continued this morning. Debate that turned angry and upset. Debate that was personal and like the drawing of a wound. In other words: debate that was vital. I suspect that this was a pattern repeated all up and down the country. That is good for the whole democratic process itself. By putting Griffin on this popular show and having MPs attack him, the BBC has allowed the real debate to open. So what is my opinion on all this? As a moral philosopher and having travelled around the world, I find myself becoming more liberal. I find myself disliking the corporate ruled world we are in, seriously disliking wars in other countries for religion and oil, not afraid of anyone whatsoever and against the aggressive over policing of the people in the UK. I remain pro choice, pro gays, pro Europe, but anti newspapers, anti celebrities and anti globalisation. I have many friends (about 40% of my chums) from ethnic backgrounds, but to me they are all British. Not black, not “them and I”, but British. I do not care for Mr Griffins views, and I will not argue them here nor link to them (raising his profile on the web – try goggle for the worst of it). I do not believe in the hate filled manifesto he has written, but on the other hand; I feel that such voices are not only to be heard, but also to a certain extent protected. Griffin may have abhorrent views, but I would rather he has the chance to spout them in public, where he can be challenged, than in a private room where all debate is lost and with it: our cultural love of democracy.